Spring is finally here, but in my neck of the woods winter is not letting go without a fight. There may be signs of spring all around but some mornings may still demand that you bundle up in a hat and gloves to go out. The big flavors and warming spirit of this spicy stew are perfect for this time of year when we are ready to shake off the coldness of winter and embrace the coming warmth of spring. This is a fun spin off of the ever classic chicken noodle soup that gets us through the winter months. By using Mexican inspired ingredients, canned veggies, salsa and cheese, this takes comfort food to a fun and spicy place! The simple ingredients make it a weeknight superstar that can easily be doubled to make leftovers for another busy early spring night. In a Dutch oven (or medium pot), add butter and melt over medium heat. 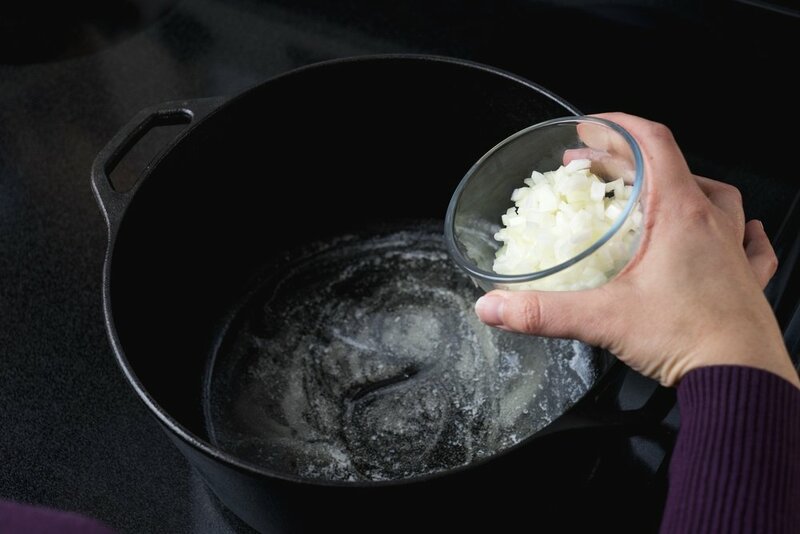 Add onion, stir to combine and cook for 5-7 minutes or until onion begins to turn golden and clear. Remove from heat and serve with your favorite taco style fixings! Check out the tips below for my from scratch tortilla strips that make an excellent and crunchy topper to this awesome stew. This recipe is very easy to adjust for flavor and taste preference. 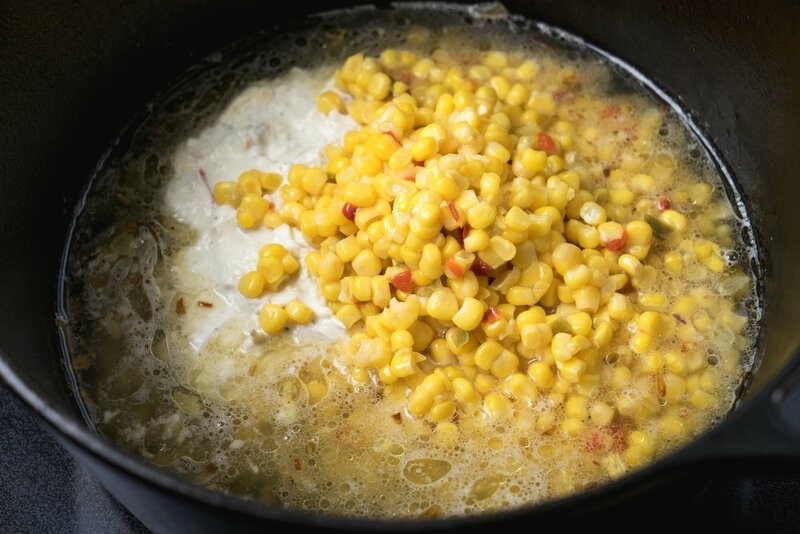 If you are not a corn fan, feel free to omit it and add diced greed pepper with the onion mixture instead. If you want to make it meatless, add in 2 cans of drained black beans instead of the cooked chicken and use vegetable broth in place of the chicken broth. This is a great base recipe to get creative with! To make the tortilla strips, set your oven to broil on the low setting and brush extra virgin olive oil on both sides of two six inch tortillas. Gently season with salt on both sides. Using a pizza cutter, cut the tortillas into bite sized strips and place on a cookie sheet. Broil for 2-3 minutes, checking on the strips frequently, until golden and crispy. Top this stew with these tasty little nuggets. If time is not on your side, you can use crushed tortilla chips to give it that nice crunch. If the stew is too thick for your liking, add additional chicken broth in 1/4 cup increments, until desired constancy is reached. 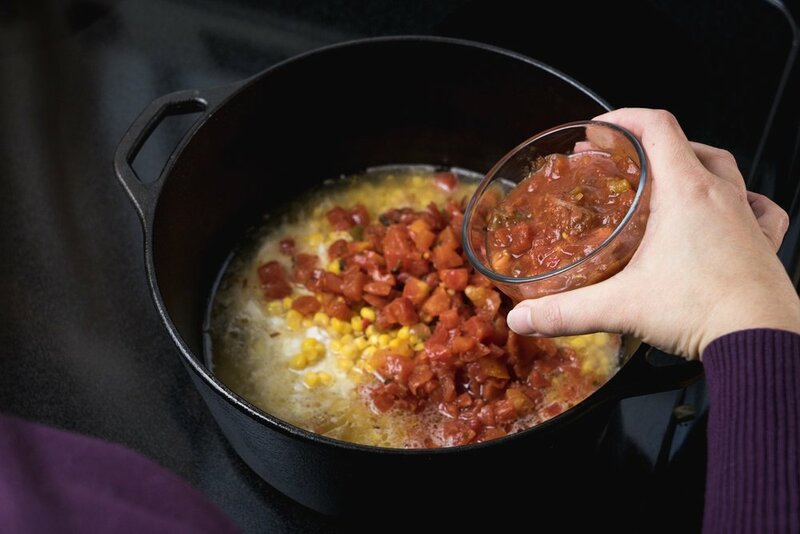 If additional broth is added, allow stew to come to once again come to a boil and simmer for an additional 3-5 minutes, tasting and adjusting seasoning as desired. If you find it is too thin and you want to bulk it up, add additional cream of chicken soup (2 tablespoons at a time) until desired consistancy is reached and continue on with the steps.